Across the globe, and especially in the United States, grieving families are seeing the benefits of working together with their friends and family to alleviate the financial strain from the loss of a loved one. Losing someone you love is stressful, painful, and difficult for families to bear alone. They should have the opportunity to focus on grieving, remembering, and celebrating the life of the departed. The very last thing that a grieving family needs to worry about is an additional financial burden. When a loved one passes, family and friends instinctively seek out ways to pay their respects or offer their condolences. Current systems and traditions leave them with limited options; they can either make a donation to a charity, or send flowers. Many friends and families wish they could do more to help the family in need. Crowdfunding is a way for families and friends to do just that. It provides friends and families with the freedom to give the exact amount they're able to give, instead of relying on being able to afford costly floral arrangements. But more than that, it allows them to contribute to a cause they identify with on a deeply personal level: helping relieve the financial burdens placed on families after the loss of someone they love. While these funds certainly go toward funeral expenses, in many cases the money raised exceeds funeral expense goals. Rest assured that you will be free to use remaining funds in a way that makes sense for your family's unique situation and challenges, with no further obligations. 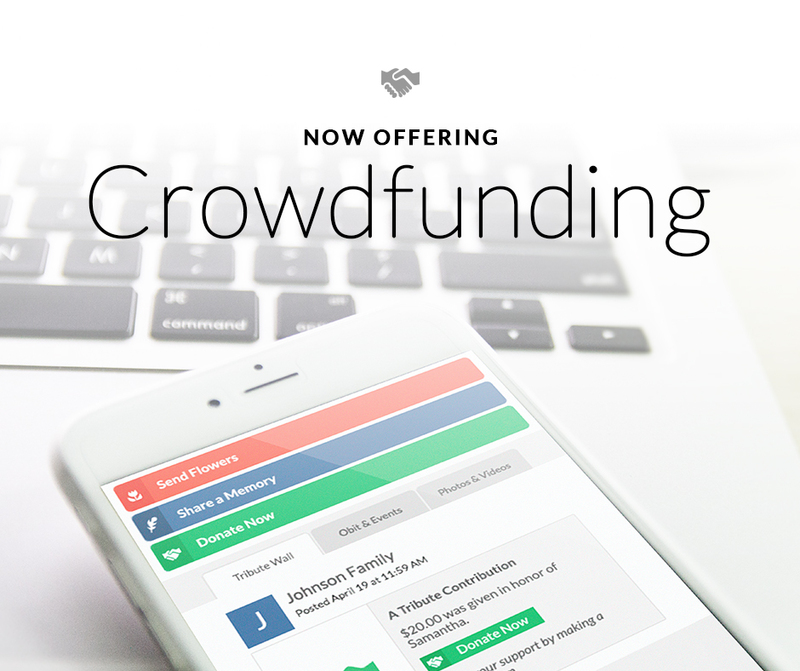 Enabling a crowdfunding campaign with your funeral home is simple. Work together with your trusted funeral director to select a campaign goal, and they will take care of the rest. Grief and heartache is more than enough for a family to bear. Using your chosen funeral home's crowdfunding capabilities relieves you of unnecessary worry and stress, and ultimately provides you with peace and comfort in a situation that warrants it most.